A new report from Bloomberg claims Google is about to revamp the way privacy is handled in Android apps. The changes would allow users to approve permissions individually for things like the camera, location, or the contact list. With Android M expected at I/O later this month, it seems like a perfect time to make this happen. It's long overdue. For all its feature shortcomings compared to Android, iOS has long offered users more control over what apps are able to access on their devices. Don't want that app to get your location? Deny it. On Android, it's an all or nothing approach. Apps list their permissions when you install them, and they get all those permissions if you proceed. We had AppOps to manage permissions for a time, but this internal debug tool is now only accessible for rooted users and those running custom ROMs. It was never an official method for controlling permissions, though, and it could bork apps when you messed with the settings. If Google introduces more modular permissions, it would have to be a system that didn't outright break apps in the event an expected permission is blocked by the user—it needs to fail gracefully. 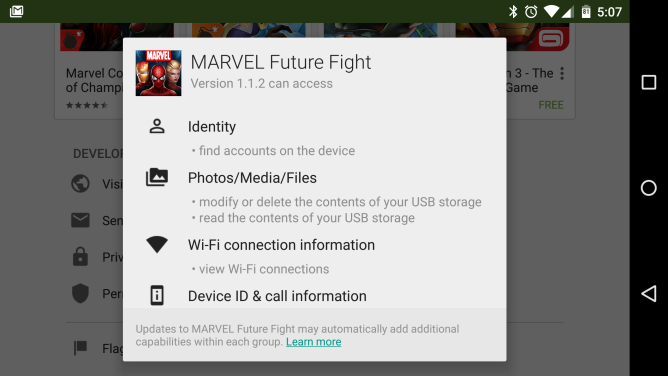 It makes sense this would come as part of a major system update, so Android M it is.